City of Wimberley City Council meetings are usually held on the first and third Thursdays of each month. Meetings begin at 6:00 p.m. at the Wimberley City Hall located at 221 Stillwater. Click here to see schedule of City Council meetings. More information can be found at www.CityofWimberley.com. 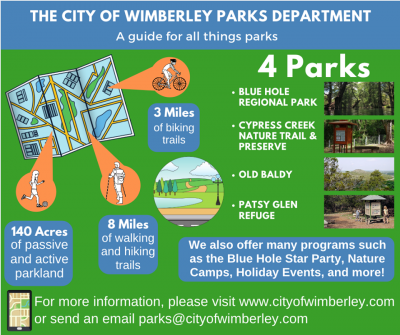 The City of Wimberley manages 4 parks in the Wimberley Valley.